My exploration of the work of Hong Sang-soo continued yesterday when I was able to track down a DVD copy of Woman on the Beach, his most recent film prior to the just released Night and Day (2008). Having watched Hong's first three films in order, I am now, purely by (Hongian) coincidence, proceeding backwards in time from Night and Day. From an evaluative standpoint, I felt Woman on the Beach to be my least favorite Hong film. It has the plainest structure and is the least dream-like of all of his work, and the second half especially lacked the complexity of his other films. But it still intrigued me for a number of reasons, especially in connection with Hong's other work. Coming to Woman on the Beach without knowing Hong's oeuvre would, I believe, deeply reduce its meaning and enjoyment, although it could also cause one to unfairly underrate it (as perhaps I've done). Rather than offer a review of the film, what I want to offer here are a few ideas around both Woman on the Beach and the reading of Hong in general. Michael Kerpan, one of the best critics of Asian cinema, commented to my previous entry on Night and Day that he is still "pondering the mysteries of the Hong-ian zoom." Hong first introduces the zoom, apparently very obtrusively, in his previous Tale of Cinema (see review discussing the zoom in that film here). I first encountered it with Night and Day, and it is on display again in Woman on the Beach. Its use is still, on the whole, rather difficult to decipher. But there is one scene where Hong uses the zoom in a clearly expressive manner. It is one of the longest takes in the very slowly edited film (ASL over 70 seconds; shot breakdown here), lasting over four minutes. It contains three zooms. After starting with a two shot of two characters, Jung-rae (a film director) and Moon-sook (the woman he and his junior colleague Chang-uk are competing over) (Figure 1), Hong zooms out to reveal Chang-uk and create a three shot (Figure 2). This is the zoom as formal play, as Hong had ended the previous scene by making the audience believe Jung-rae and Moon-sook were going to liaison away from the other man. As the scene progresses, Moon-sook reveals that while living in Germany she had serious (meaning sexual) relationships with two or three foreigners. At this point, Jung-rae begins a tirade against "unattractive" Korean women who leave the country and become desirable in foreign cultures where Asian women are eroticized. At the beginning of his speech Hong zooms back in (Figure 3), commenting on his closed-mindedness and the anxiety her admission has provoked. Tellingly, he states that he is not bothered about the myth of Western men having larger penises, unconsciously revealing, of course, that this is exactly why he is upset, and not the absurd reason he mentions. Eventually, she responds by saying that he is a typical Korean man. At this point, Hong zooms back out (Figure 4). Jung-rae leaves and the shot finally cuts. This scene is not only the most compelling of the film, but it is also a great microcosm, in its dialogue and zooms, for the entire movement of the work. The above quote is from Slavoj Zizek, from his book Looking Awry, which I recently re-read. The passage came to my mind while watching Woman on the Beach and reflecting on Hong's work in general. While it was serendipity that led to this connection, I think the link between Hong and psychoanalysis is more than simply in my mind. Hong holds a fascination for formalist critics such as David Bordwell, but his films are equally compelling for a psychoanalytical reading. As typical of Hong, Woman on the Beach features a scene that is a repetition of an earlier sequence. Figure 5 is a centered two-shot of Jung-rae and Moon-sook during their first moments alone together. 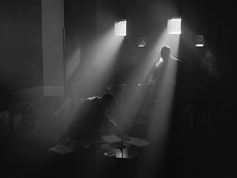 It is the most self-consciously beautiful in the film, and its striking cinematography makes its replay later in the film all the more noticeable (Figure 6). This time, Jung-rae is with a different woman, Seon-hee, who he met earlier in the day. Although the scene replays itself, there is a difference beyond simply the woman herself. The framing is no longer centered and balanced, and it is also slightly to the right of the earlier alignment. I would propose that the reason for this can be explained by the above quotation. Whereas the meeting with Moon-sook happened by chance, the courtship of the later woman was deliberately planned. He meets her by asking to interview her for a film because she looks like Moon-sook. In other words, he tries to replace her in his libidinal structure, which he eventually does. But when Moon-sook returns the next day, he chooses to return to her. However arbitrary she may be, Moon-sook was found as opposed to placed. This allows her to maintain a sense of illusion and fascination. Through his slightly mis-placed mise-en-scene, Hong subtly conveys this concept. While Bordwell's interpretation here is certainly debatable (I find it far more schematic in terms of positive versus negative characters than what Hong actually presents), it is valid and even compelling in reading Hong's recent films in relation to his earlier work. What I problematic is the way Bordwell seems to be willfully ignorant of the more troubling aspects of the scene. 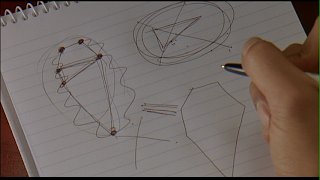 The fact that the triangle represents a relationship with a foreigner, which is then crossed out, is not even described by Bordwell, let alone analyzed. Yet it is key to the scene and how we interpret its meaning. How do we read the crossed out triangle? Is it a call for acceptance of people? Or an evasion of aspects of people we cannot accept and thus need to be eliminated? It is here that we need to move beyond formalism. And although I do not have the time or probably the ability to apply a thorough psychoanalytical reading here, it seems to be inviting one with its blotch of the Real, its "pieces", and even its coffin-shape (death drive, anyone?). A final note: Hong's discussion of sexual anxiety and Western foreigners is the first I've come across in Korean films, which is admittedly a small sample. I'd be curious how far reaching this exclusion is. Also, this looks forward to Hong's next film, Night and Day, which takes place mostly in France but features an almost exclusively Korean cast, reflecting the continued isolation of Korean characters within another country. I'm interested to see if Hong continues to incorporate more notions of "otherness" is his next films. It seems a fruitful avenue to explore to move away from the notions of purity and idealism that haunt all his films with the exception of Night and Day. David Bordwell, "Beyond Asian Minimalism: Hong Sangsoo's Geometry Lesson," in Huh Moonyung, Hong Sangsoo (Seoul: Korean Film Council, 2007): 19-29. Did you know you can shorten your urls with Shortest and get money for every visitor to your shortened links.